© 2019 KPNX-TV. All Rights Reserved. The woman was booked on nearly 30 counts of animal cruelty. 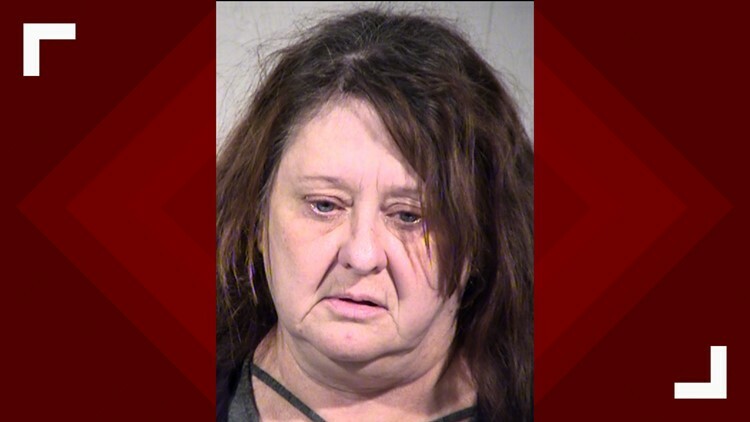 PHOENIX — A Mesa woman was arrested and booked on nearly 30 counts of animal cruelty after six dead dogs, two animals skulls and the skeletal remains of "what appeared to be a dog" were found inside her home. According to court documents, police served a search warrant at Theresa Finneren's home near Stapley Drive and Maine Street on Jan. 15. The probable cause statement described the living conditions inside the home as being "so egregious, that the city building official had to condemn the residence." "The inside of the residence was covered in dog feces, to the point that we could not walk anywhere inside the residence without stepping in dog feces," the probable cause statement said. According to court documents, inside the home were 12 dogs and five cats in "various health conditions." Court paperwork also revealed six dead dogs were found inside a trash can in the kitchen, two animal skulls were in one of the bedrooms and the skeletal remains of "what appeared to be a dog" were on a couch in the living room. According to the court documents, no one was living at the home and Mesa police and animal control had received "numerous complaints" about the smell from the home. Finneren called investigators a day later about what was found at her home, according to the documents. She said she was sorry and should've done more to care for the animals. During an interview with police on Tuesday, Finneren said she felt depressed and was overwhelmed and stopped caring as of July 2018, court documents said. She told police she had given up and felt awful and guilty about the dogs. According to court records, Finneren told police the dogs had died from "different causes," some even died "a while ago." The causes of death she mentions included fighting, valley fever and old age. Finneren said she had found one of the dogs dead in the house after it had gotten into a fight with another dog. She also told police the skeletal remains were from dogs who died of old age. She had put them in a bag, in a trash can and said the other dogs must have got into the trash can and eaten them, court documents said. According to the paperwork, when asked by police what she would've done differently, Finneren said, "I would try to find medical help, I guess I would have called animal control." Finneren was arrested and booked on 27 counts of animal cruelty.